This is the Chore List that works for our family. I have it hanging on the fridge and follow it every day. Okay, most days. Okay, Some days. The point here is: It works (when you follow it). And now, I am offering it to you so that you can customize it to fit your families needs and you can use it (and sometimes not) too. I am blessed to be a stay at home mom. My husband is willing to work longer and harder at his job so that I can do what I’ve always wanted by staying home and watching our children grow. Because of that, I am willing to do the majority of the household chores. I consider that my job. So, on our Chore List, He only has minimal chores. You may want to change it up for yours. We also only have young children (3 years and under 1) so they have very few chores. My daughter, obviously, has none and my son’s chores are to help me with mine. However, I still wrote something down for him, just to teach him to recognize that, as an equal part of this family, he has chores on the Chore List. You may add more chores for your children/husband or take them off completely. That’s all up to you. This is just the jumping off point for you to start your list. Enjoy! 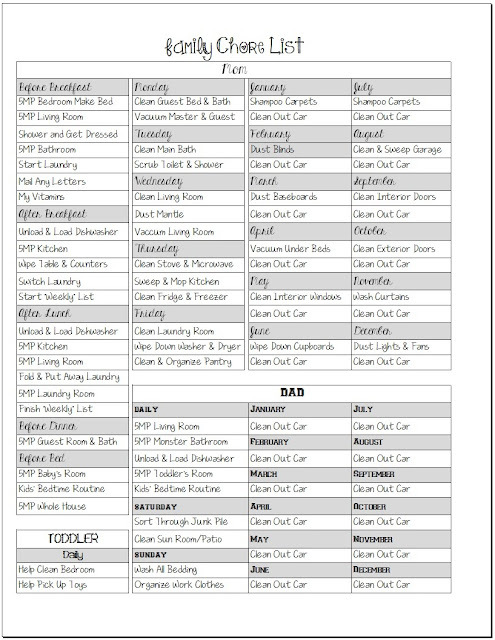 Click Here to download the Chore List. It means "5 Minute Pick-Up" — basically, just a quick walk through/tidy up of the room. Sometimes I even set a timer or play 2 songs (songs are usually about 3 minutes long, give or take) to time myself and I "race" my son to see who can pick up more in the allotted time. That is so hard. My son is about to turn 4 and we are starting to struggle, as well. Something that I know helps for my son is racing. We either race to see who can pick up the toys the fastest or even set an egg timer and see if he can beat it. I'm not sure how long that will work, but it does the trick for now. I must be slow or computer illiterate. The download I'm getting is a .pdf file and does not seem to be editable. How do I edit the chores?